All versions of Mac OS X default to saving captured screen shot files to PNG format, but if you’d rather have screenshots save as another file type, it’s actually quite easy to modify the file format and change the default to something new. Whether the desired format output is JPG, TIFF, PDF, GIF, or back to PNG defaults, let’s walk through the process of changing the format of screenshots made on the Mac. This applies to all versions of Mac OS X. To switch the image file format used by screen shots you’ll need to use a defaults command. To get started, launch Terminal, located in the /Applications/Utilities/ folder (it’s accessible through Spotlight and Launchpad as well), and then use the following command strings to change to the appropriate file format. Syntax needs to be entered exactly and onto a single command line prompt to execute properly. Now take a screen shot as usual in Mac OS X (Command+Shift+3) and locate the file on the desktop to verify the change has taken place, the file extension should now be .jpg as will the image format itself. JPG is perhaps the most popular alternative, since it’s compressed by default while still retaining fairly decent image quality, and it’s also an extremely common type of web graphic. 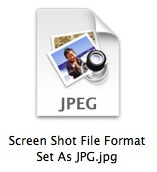 For many of us, switching the screenshot format to JPEG is the primary objective. For the remaining file types we will combine the command strings together making them easier to copy & paste into the terminal as a single line of command syntax. Changes will take effect automatically. Now if you take a screen capture, it’ll appear as whatever file type you specified. This advice appears to work wonderfully. I think people just copy commands from one the web page and put them into their terminal and try it out. It’s best to try this yourself, which works great to change the file capture format in Mac of screenshot files, before commenting. Do this without checking whether it actually works or not. alternatively, it means you are doing something wrong. if you don’t kill SystemUIServer the changes do not take effect. i set mine to jpg a long time ago, png is too heavy and offers no advantages. it works fine. It works perfectly for me in OS X Lion. You need to use killall SystemUIServer at the end maybe you forgot to do so. Nope. It doesn’t work here either. It definitely works. Everything we publish we test and review. Terminal command, with the killer UI after, worked on OS 10.10.2 too – did run terminal and killer a couple times to try various format – HOWEVER, my “capture save on screen” goes in .jpeg and my “capture in memory to paste” goes in .pdf … is there two terminal command for each of the forms or 1 for all??? Worked beautifully! Thank you so much! I was actually really upset that when I updated to Lion OSX,all of my screenshots were saved at png files, and the only way I could save them as jpg extensions was to literally duplicate the screenshot in preview (because Lion got rid of the “save as” option =/), and then save the copy as a jpg and delete the original. Such an unnecessary hassle. Glad I stumbled upon this! If there were only a way to do this in iOS. I don’t like the huge filesize of PNG files. Maybe I’ve been around for so long that I prefer the compressed picture formats but given the actual size of an iOS device such as an iPhone or iPod touch, .jpg files are more than sufficient to use as the default picture filetype for screenshots. This is a problem when I post screenshots in Twitter and I look at the size of a PNG file and it disturbs me the size when and if I export the file to .jpg, it’s at least have the file size. This does not work for me in Mountain Lion. Anyone know of a way to make it work in Mountain Lion or am I the only one unable to change it? Screenshots come out as .tiff files even after doing the terminal command to change them to .jpg. I’ve tried various tips but still can’t find a way of converting a screenshot into a JPG in Mountain Lion. Worked fine in Snow Leopard but now the ‘Save as’ button has gone, there’s no obvious way to do it. If you are using Preview, you can use the “Export” option. This is a really dumb idea. NEVER use Terminal if you don’t have to. Half the people who do this will not remember later how they changed this, so they will have to search online again. Also, a goof in typing in Terminal could cause problems that you don’t know how to fix. Just use OnyX. It allows making these changes in GUI, which is much safer than command line. It allows many other tweaks and system maintenance steps, also, such as clearing caches and logs or showing hidden files. then all these changes are easy as pie to revert using the same OnyX gui. Leave command line to the Linux geeks and don’t go to Terminal unless you have no GUI option. I am always amazed that there are a hundred different blog and tip site articles about editing a text document, such as the Hosts file, in Terminal. Geeze, folks, it’s a text document. You can edit it in TextEdit, for crying out loud!!! Changing the file format of screen shots created in Mac OS X is not a dumb idea. The terminal is best for advanced users though, if it’s confusing to someone they should not do it. And editing the /etc/hosts file, which is completely different from changing file formats of screen shots, requires administrator access to the hosts file, which is why most people turn to the terminal for that. Possible source of confusion: this works as advertised when using the OSX keyboard shortcuts to take screenshots, but it does not work if you use the Grab app. Now, with the change to JPG, no extension…. This its important because most of my clients use Win, so extension needed! Works great in Mac OS X with El Capitan too, thanks. I changed the file type of my screen shots to JPEG because I prefer the jpeg format to png as it is compressed already, PNG files are quite large.